One One Eight is Cotswolds serenity overload. It’s the view over the freshwater lake from the rooftop terrace. A barefoot pad out to the balcony to watch the geese. A marination in the heated indoor and outdoor pools. A sunset supper over the lake. Late-night chatter lit by the logburner. Welcome to Chillsville. Get ready for a serenity overload. 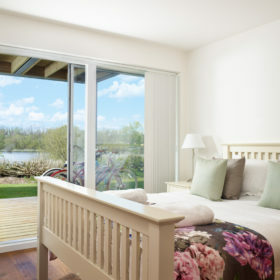 Breathe in the Cotswolds air from the bedroom balconies. 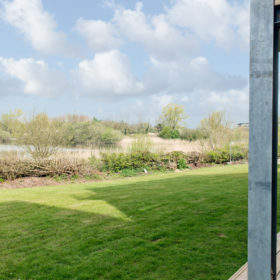 Gaze over the mirror surface of the lake from the bespoke rooftop terrace. 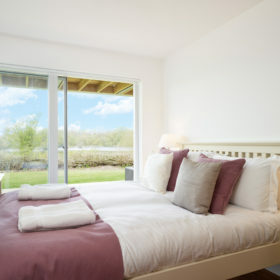 Swim indoors in 30-degree comfort in the pure Cotswolds air. 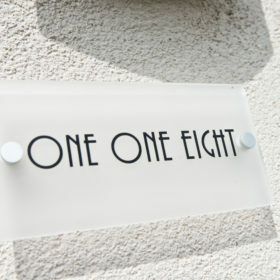 If you could drink calm, beauty and rejuvenation, One One Eight would be one over the eight. Stressful life? 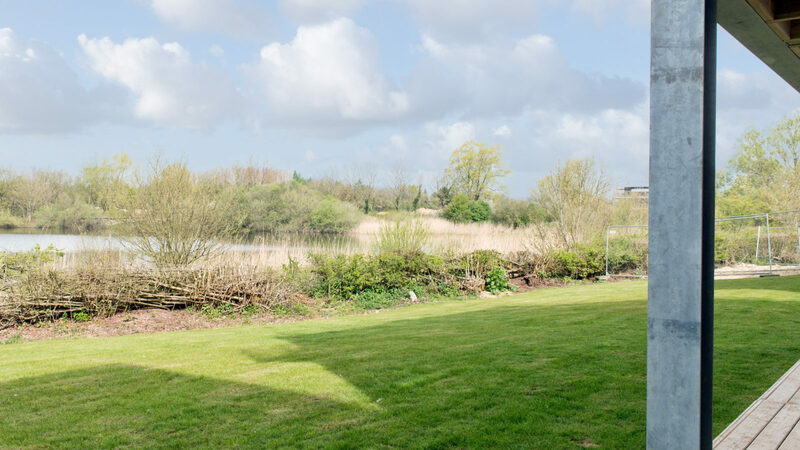 Welcome to the land of the long unwind, with two freshwater lakes on a 550-acre slice of the Cotswold Water Park. 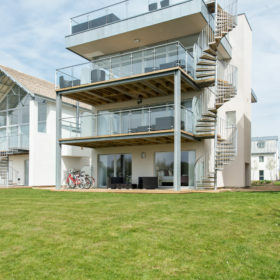 View it all from the glass-fronted, balconied, contemporary beauty of One One Eight, sleeping 12 families, couples or friends on the lookout for serious relaxation. Head to the ArtSpa to luxuriate in the slate-lined heated indoor and outdoor pools and drop into the eco plunge pool. Recharge on the retro console in the games room, catch a match or a movie in front of the wall TV, or just slide back the doors from the bedroom or living room and say hi to inside-out living. 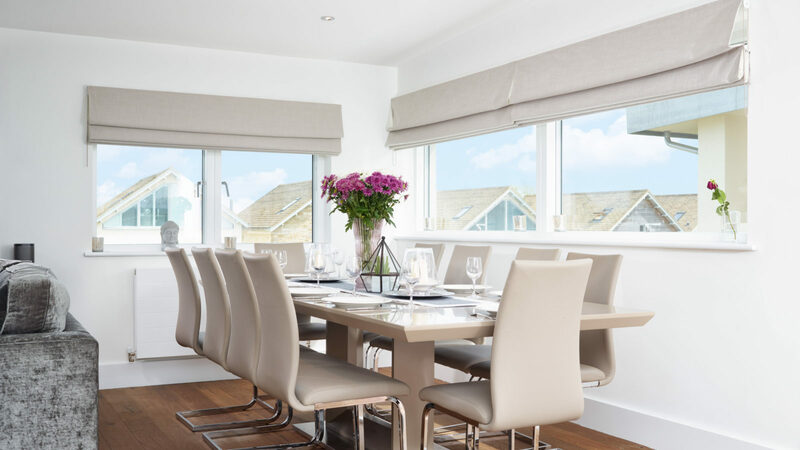 Cook in an oasis of contemporary granite and walnut, then dine on the rooftop terrace to the gentle sound of the oystercatchers and Canada geese. Watch the birds on the lake from the rooftop as the sun sets. Take a nightcap by the logburner. Sleep deeply in crisp cotton with the doors awake to the lake. Access to outdoor living here is just the slide of a door away as you saunter out to the balconies from the bedroom and living area. Take a book, a bottle and a wide-brimmed hat. 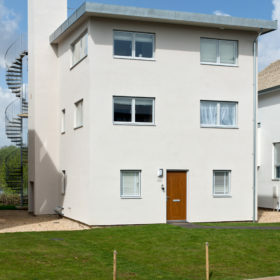 Heading upwards from the second-floor landing sits the roof terrace with its electrically operated roof light. Load up with steaks, sausages and salad and get the rooftop barbie going. 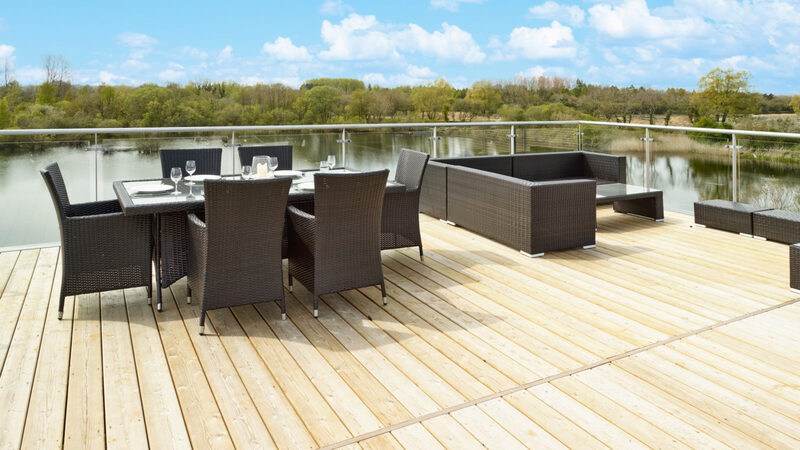 Settle back on the rattan furniture and tuck in as you watch the geese land on Swillbrook Lake. This is life on a nature reserve. See over 25 species of water birds over winter. See breeding cuckoos and nightingales in spring and house martins heading home from Africa. Walk the wildflower meadows in summer and watch the damselflies and dragonflies around the lakes. Keep your eyes peeled for otters and water voles. Head out by boat and fish the lakes. 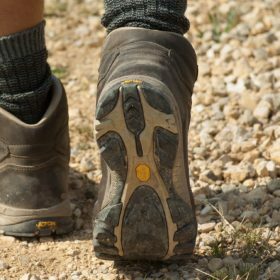 Run the network of footpaths. Head to the spa to swim the two heated pools, dive into the lily-filtered eco-pool, then refresh and revive in the sauna and steam room. Welcome to the Great Indoors. Inside or out, living spaces at One One Eight are always cool and contemporary. 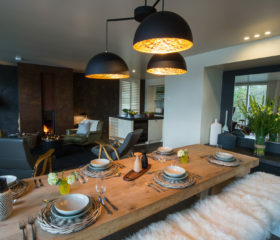 It’s the light you notice first, infused with the special qualities that come from living by lakes in an eco-house fronted by walled glass. It’s all rather zen. Drink it in. The style here is deliciously, decadently different. 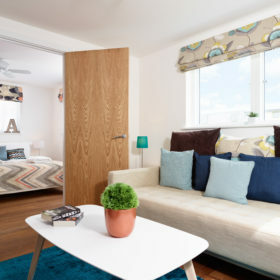 Move up to the second floor to be together in two spacious open-plan living areas furnished with giant sofas and hardwood floors. Catch some TV here, tap into the wifi or just break out a book. Get the wood-burning stove going and kick back in the fireside chairs. 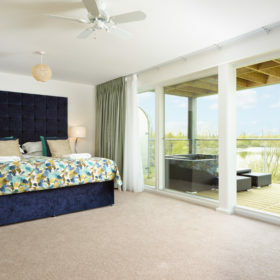 Slide back the doors to the Great Outdoors and the westerly balcony with its lake views. Move out to the bespoke roof terrace to spread out on the rattan furniture, and birdwatch or bookworm to your heart’s content. Or get down to the games room around the wall-mounted TV, play table football or play on the retro Pac-Man arcade machine. You’ll flow here between the indoors and out as easily as the wifi. 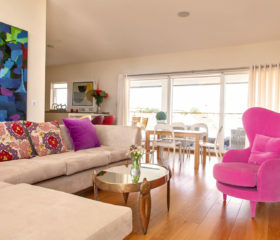 Get snug in the comfy living areas, or slide out to the sun, on your own or as part of your party. 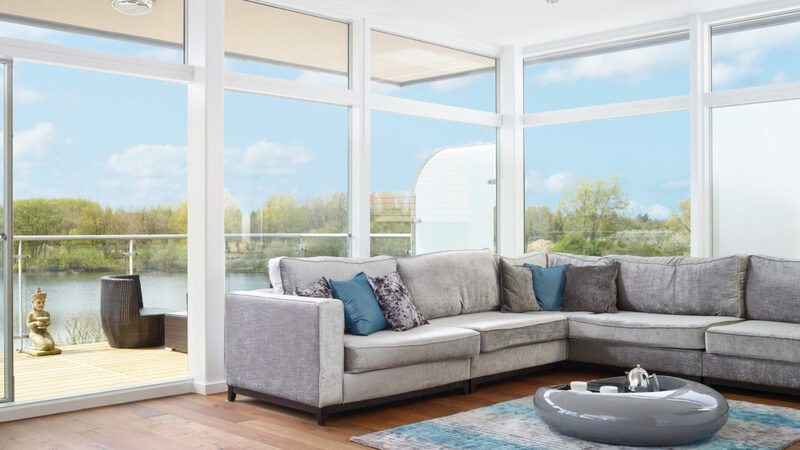 Living areas at One One Eight are flexible, fun spaces lit by the light off the lake and the big Cotswold skies that hang overhead. Cooking here could turn you into a master chef. 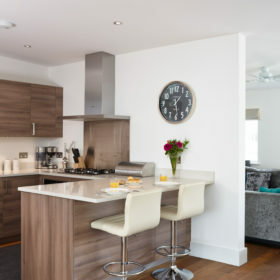 You’ll be inspired by the granite, the walnut and the built-in appliances, by the al-fresco feel with the doors open and by the profusion of local organic fruit and veg, Cotswold beef, cheeses and chutneys. But if you’d prefer to sit back and simmer, we have the solution. 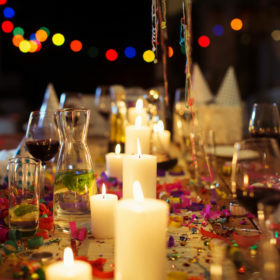 For a one-off occasion or for a fully catered break, call up Dine Indulge and let personal chefs provide you with gorgeous gastronomy while you sit back and sip a Pepsi or a Prosecco. So what will it be? Maybe pistachio-crusted fromage frais followed by caper-cured and roasted monkfish tail? Enjoy. We’ll even wash up. 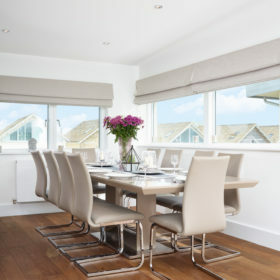 Eat sociably in the open-plan dining area with the doors open to the fresh Cotswold air, or head out to the rooftop terrace to sit around the rattan dining furniture and soak up the sunshine and the lake views. 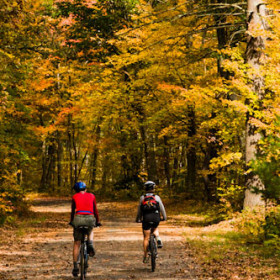 Buy organically from the site shop or just eat in the café during main season. Pop out to the Baker’s Arms for sirloin steaks, Gloucester Old Spot sausage, or boar burger. Go Spanish at Tierra and Mar. Try budget-friendly salads and sandwiches, or a full English, from LB’s. For Michelin-recognised breakfast or lunch, head to Made by Bob, home of exotic ingredients such as labneh and fregola. The six bedrooms here are a cut above in quality and a couple of levels above the lake. 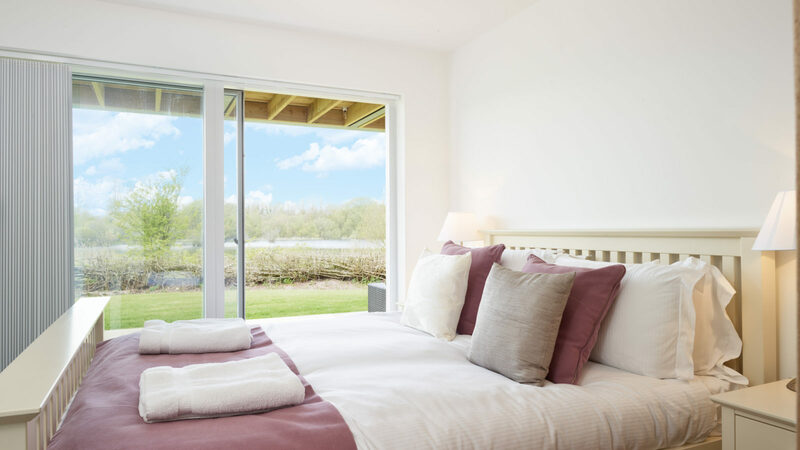 Sleep in crisp-cotton comfort with the doors open to the balcony and the quiet lapping of the lake water. 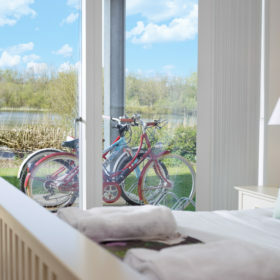 On the ground floor, you’ll find two king lakeside bedrooms, one with en-suite WC, further children’s bunk room and family shower room with walk-in shower. Heading up, the first floor provides the master bedroom suite with doors onto the west-facing balcony. Pop out to the outdoor furniture to enjoy the late-afternoon sun. 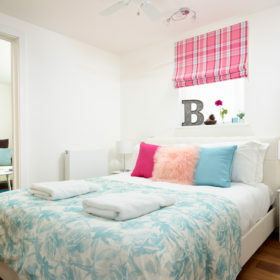 Two further bedrooms, a king and a double, offer access to an adjoining snug with sofa and TV. 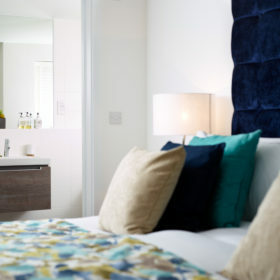 Stay on site for the tranquil spa with pools and sauna, boating, biking and walking. Head off to jet-ski, water-ski, paintball or golf. 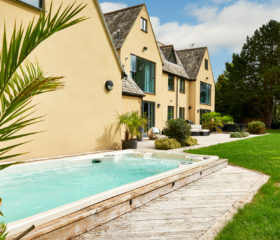 See the honeystone Cotswolds and Bath’s hot springs. 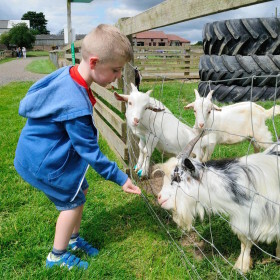 Kids can meet chicks and rabbits at the Farm Park, walk the Slaughters, or meet Brum at the Cotswold Motoring Museum.